I am not one to beg my pediatrician for antibiotics for my kids. I understand the dangers of of creating drug resistant bacteria, and I don't relish the prospect of overmedicating my children. So perhaps it sounds strange that there are times when I say a little prayer of hope that the doctor will indeed discover an ear infection with his or her otoscope. But when nearly everyone in the house has been ill for going on two weeks, and a diagnosis of virus means continuing the struggle with no clear end in sight, a bacteria that can be quickly fought with a drug is a blessing. Today, I took both of my boys in to see the doctor. L. has another ear infection, and O. 's sinus were raging and inflammed. 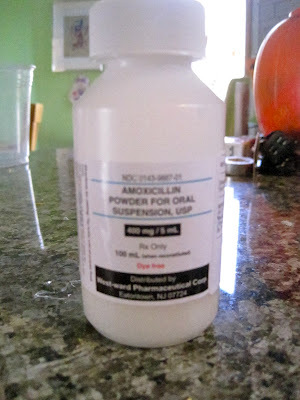 I am grateful for easy access to inexpensive and effective antibiotics. I am grateful that soon my two sweet boys will be feeling better. The "virus diagnosis" is such a frustrating one, isn't it? I too am thankful for ailments that are identifiable and curable, for the resources to obtain medical advice and appropriate pharmaceuticals. I am also thankful that our new CVS has a drive-thru.